Carl Wilson cracked an unbeaten 63 as Bourne beat Market Deeping. Bourne claimed the local bragging rights with a three-wicket win over neighbours Market Deeping at the Abbey Lawns yesterday (August 22). It took an unbroken half century stand for the eighth wicket between Carl Wilson (63no) and Jack Berry (26no) to steer Bourne past Deeping’s 199. 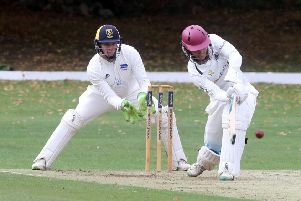 Wicket-keeper Wilson had earlier been involved in a controversial caught behind decision which saw off Deeping pro Emile Kriek for just seven. Captain David Gillett (33) and Ajaz Akhtar (32) top scored for Deeping as seamer Martin Shillito claimed 4-47 for Bourne. Meli Adatia bagged 4-76 for Deeping, but Bourne avenged a defeat earlier in the season at Outgang Road and look set to finish higher than their deadliest rivals. Bourne are third, 17 points ahead of sixth-placed Deeping with three matches to go. Spalding could be relegated next weekend, Their cause is now hopeless after a crushing nine-wicket defeat at home to Skegness. Josh Newton scored 50 of Spalding’s 179-9. Bourne 200-7 (C. Wilson 63no, P. Morgan 30, J. Berry 26no, C. Louth 21, M. Adatia 4-76, P. Brown 2-46). Spalding 179-9 (J. Newton 50). Skegness 180-1 (Houghton 112no, Epton 55).